There has been much debate on proper squat techniques. Is it proper to maintain a vertical shin and prevent the knees from going beyond the toes? Is it better to squat and allow the knee to go beyond the toes? Proponents of the vertical shin technique argue it is best to save the knees and this helps increase posterior chain strength. Whereas proponents of parallel lines say, distribute the weight evenly and save the back. The purpose of this blog is to shed some light on the debate and provide the rationale for proper squat technique. Early studies state that squatting with external loads causes undue stress and damage to soft tissue at the knee joint. 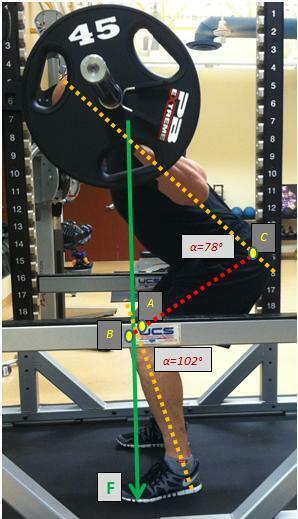 This precipitated many experts to change squat mechanics. A vertical shin angle prevents excessive knee flexion, thus limiting the stress placed at the knee joint and potential damage to integral knee structures such as the meniscii, articular cartilage and ligaments. In addition, many state that maintaining a vertical shin angle allows for enhanced strengthening of the posterior chain (hamstrings, glutes, low back). I agree it is important to protect the knees. However, the lower back is much more important, in my opinion. Low-back pain is one of the major forms of musculoskeletal degeneration seen in the adult population, affecting nearly 80% of all adults (1). It has been estimated that the annual costs attributable to low-back pain in the United States are greater than $26 billion (2). In addition, 6 to 15% of athletes experience low-back pain in a given year (3, 4). The body is an interconnected chain, and compensation or dysfunction in the LPHC region can lead to dysfunctions in other areas of the body (5). So why do we squat to protect the knees? How should we squat? Do a quick check and test your squat mechanics. Evaluate your technique by watching in a mirror. 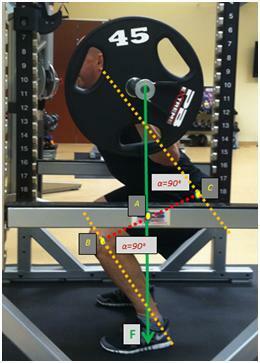 At the bottom of the squat the torso and tibia should be parallel to each other (See image below). Have you ever noticed how a baby squats? Do a quick google search for baby squat. You will be amazed at their technique. They lift properly, because they have the flexibility to get in to a deep squat without excessive leaning at the low back. It does not matter if the knees go past the toes. The most important thing to ask: is the back parallel with the shin? Fry et al. (2003) examined the hip and knee torque forces of variations of parallel squats and concluded appropriate joint loading during this exercise may require the knees to move slightly past the toes. Restricting squats created significant increases of excessive forward lean and subsequent increased torque loads at the low back and hip (6). Maintaining a vertical shank did not yield change knee torque significantly (6). You can clearly see that squatting with a vertical shin reduces stress placed on the knee, but significantly increases torque on the low back. Do we really want to place an increased load at the lower back, when it is so prone to injury? The most important thing to consider is overall exercise technique. Lifting with ideal posture is paramount for injury prevention. When this occurs forces will be distributed equally throughout the kinetic chain. 2. Luo X, Pietrobon R, Sun SX, Liu GG, Hey L. Estimates and patterns of direct health care expenditures among individuals with back pain in the United States. Spine 2004;29:79–86. 3. Nadler SF, Malanga GA, DePrince M, Stitik TP, Feinberg JH. The relationship between lower extremity injury, low back pain, and hip muscle strength in male and female collegiate athletes. Clin J Sport Med 2000;10:89–97. 4. Nadler SF, Malanga GA, Feinberg JH, Rubanni M, Moley P, Foye P. Functional performance deficits in athletes with previous lower extremity injury. Clin J Sport Med 2002;12:73–8. 5. Powers CM. The influence of altered lower-extremity kinematics on patellofemoral joint dysfunction: a theoretical perspective. J Orthop Sports Phys Ther 2003;33(11):639–46. This entry was posted in Fitness Training, Knee, Low-Back, Mechanics, Sports Medicine, Sports Performance, Weight Training and tagged low back, Squat, technique, vertical shin on April 17, 2012 by Joshua Stone. I have a few questions. First, what exactly is the significance of the back and shin being parallel? Is it just a way of measuring equal proportions of the load being placed on the hips and knees? Second, Fry stated that the torque was placed on the knee joint and hip joint. Squatting with the load placed more heavily on the hips (vertical shins) would require more hip flexion which would cause the load to be placed on the hip extensors, adductors, and abductors. A squat with more vertically oriented shins requires more of the load to be placed on the posterior chain, but with rigid spinal erectors, there wouldn’t necessarily cause torque on the low back, just more flexion at the hip and less at the knee. I may be wrong, I guess I just need some extra explanation. Also, I’m a powerlifter so I may just have a bias causing me to favor the emphasis of the use of the posterior chain. Great blog, by the way. You’ve got lots of really great posts! It absolutely does increase torque. 2 reasons. Take a look at force arm and resistance arm. The longer the force arm is from axis of rotation the easier the lift. For example, try closing a door from the door knob. Then try closing the door while pulling from near the door hinge. When the force is applied from a longer distance (at the door knob) the force needed to overcome load is much less. Same goes for resistance arm. Hold a 50 lb dumbbell and do shoulder flexion with the arm fully extended. Now perform shoulder flexion with fully flexed. The lift is much easier with arm flexed because resistance arm is much shorter. In the squat, with excessive flexion at the hip, the horizontal resistance arm of the low back is significantly increased relative to the axis of rotation (hips). In addition, angle of flexion will alter force production. Considering length tension relationships, when excessive forward lean is noted the posterior chain is in a mechanical disadvantage (lifting from a lengthened state). All that said, I agree loading the posterior chain is important. Also, for every statement I make here there will. E someone else who states otherwise. But I stand by my opinion, I would rather lift with equal weight distribution but can understand the pundits thought process. In my opinion squat as deep as your ankle dorsiflexion will permit. Once dorsiflexion stops all additional ROM needed must be made up from low back or the knee. A good guy to study don chaffin from the university of Michigan center for ergonomics. He has done a lot of low back load modeling. 2-d and 3-d systems which discuss lumbar shift and load to failure. Thanks for reading my blog and thanks for the inquiry. Fair enough. I guess I was thinking of it in a different way, but you’re definitely right now that you explain it. Thanks for the reply, and keep up the good work! Thanks man. I will try.